Buy Elinor's look: Dress , $30.99 ; Shoes, $84.99 ; Bag, $20.25 ; Necklace, $35 ; Crown Ring , $6.90. 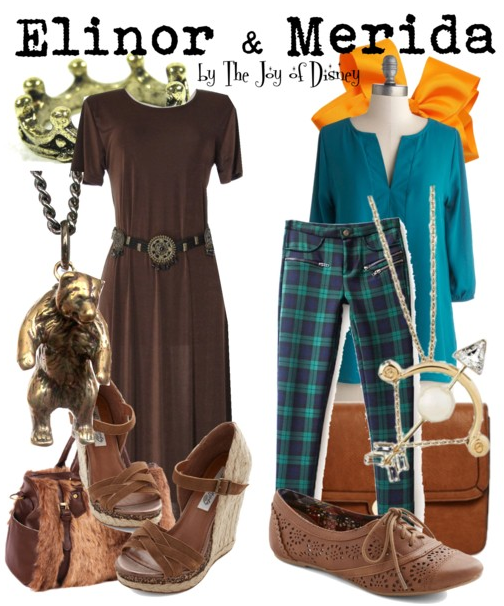 Buy Merida's look: Top, $39.99 ; Pants , $30.99 ; Shoes, $34.99 ; Bag, $69.55 ; Necklace, $7.56 ; Bow , $2.45. Mother and daughter outfits inspired by Elinor and Merida from the movie Brave!